Sole agent and manufacturer J.T. Davenport. 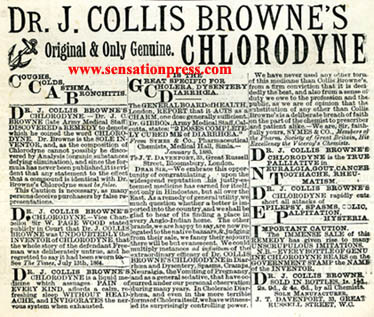 As with most patent medicines, Dr. J. Collis Browne's medicine was advertised as a cure for just about everything. Typical ingredients included opium and chloroform, so it was little wonder that a patient slept well. 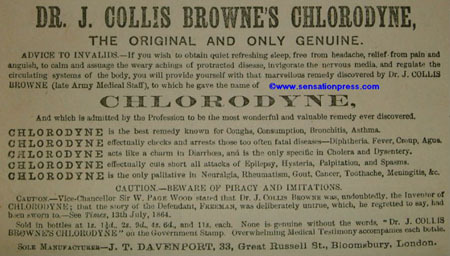 Dr. J. Collis Browne's Chlorodyne. The greatesr medical discovery of the present century. 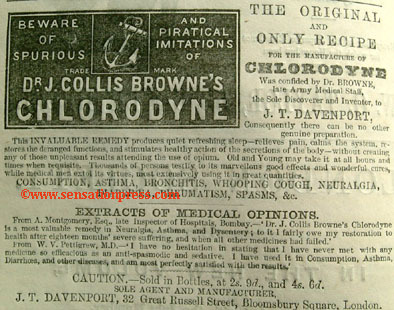 An advert published circa 1884. Coughs, Colds, Asthma, Bronchitis, Cholera, Dysentery, Diarrhoea.